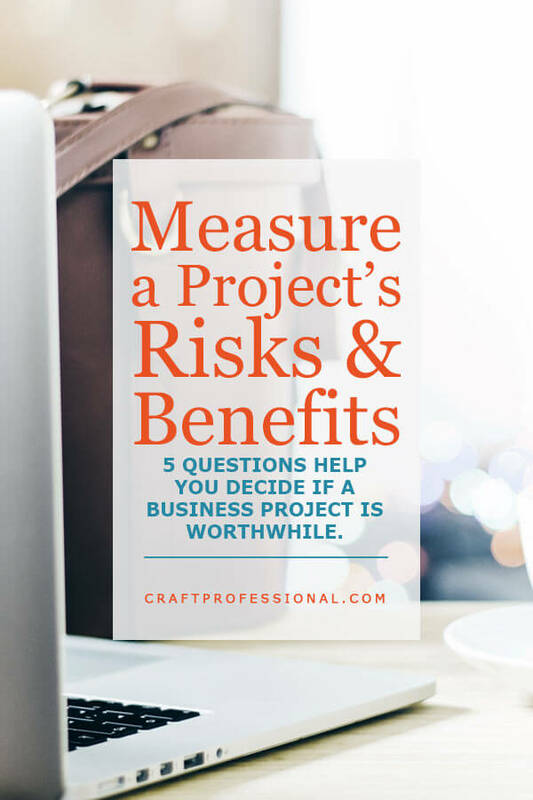 You need to be smart about measuring new project benefits and risks, so you can spend your time and money wisely. Your resources - both time and money - have limitations and are precious. Before you dive into a project, whether that means developing a new product, or participating in a sales or marketing event, or partnering with another business owner on a project, you need to carefully examine the potential rewards and risks, as well as the probability of success. Ask yourself these 5 questions to decide if a new project's benefits are worth the sacrifices you'll need to make to achieve success. 1. What, exactly, does this project involve? Before you can assess anything, you need to know precisely what you're dealing with. You can't determine the potential rewards, or the sacrifices you'll need to make unless you can see clearly what your project would involve. Define your project. Write a statement that thoroughly describes the nature of the project. Determine what, exactly will it look like when you've completed the project or have your new venture up and running. 2. What can I reasonably expect to expect to gain? What are the potential rewards of successfully completing the project? Consider short-term, and more long-term rewards. Will there be financial rewards for your business? Will it set you up to pursue a larger goal? If it's a new product you're developing, how much profit will there be in selling one item? How many items could you reasonably expect to sell in a year, or in several years? Does the product lend itself to repeat customers? If it's a different type of project, for example, a sales or marketing strategy you might pursue, how will it benefit your business? Will you make sales directly from this project? How much income might it generate? Is the project more about building your brand? How will you measure the success of that type of project? 3. What will I have to sacrifice or risk to pursue this project? Every project we pursue requires some type of sacrifice, usually in the form of time or money. What will you have to sacrifice and commit to in order to make this project you're considering a success? Work out both the financial and the time costs involved in pursuing a project. From start to finish, what will you need to invest and sacrifice to get this project off the ground? Also consider the things you won't be able to do if you're busy pursuing this project. These things that you won't be able to do are your opportunity costs. If you've committed your time and money to a specific project, then there will surely be other things you won't be able to spend that time and money on. Maybe you'll need to get up early to find time to work on a project, and you're giving up an extra hour in bed each morning. Maybe you have another business idea in mind, but you have to focus on one project at a time, so that other idea will be put on the shelf until a later time. 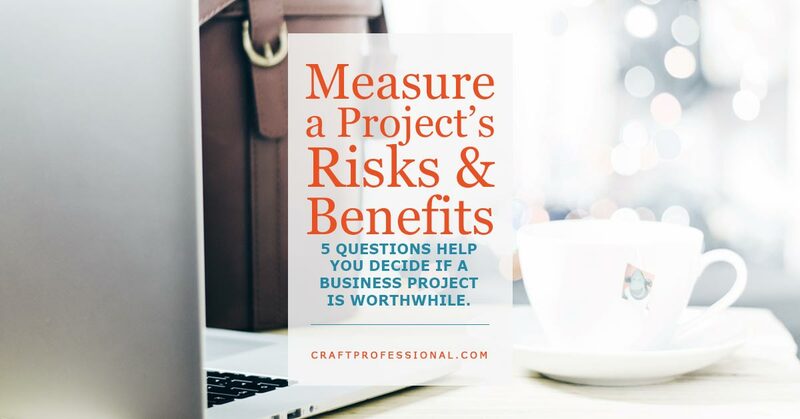 Know your risks and opportunity costs before you dive in, so you'll know exactly what you're sacrificing, and you can determine if the project is worth that sacrifice or if you should focus your resources on something else. 4. What are the chances for success? Realistically, what are the chances your project will be successful? Is there a lot of competition? Is there a reasonable demand? Look for people who've pursued a similar project in the past? How well did they do? Ask yourself what your life and business look like if you complete this project. If this is a significant project, then successfully completing it will likely change your life or your business in some way. How will the completion of your project impact your life or your business? Will the outcome move your business and your life in a direction that makes your happy? Alternatively, what if you pursue this project and it's not as successful as you had hoped. What would your life and business look like in that case? Will you have spent resources you couldn't really afford to lose? Will you be able to regroup, learn from the experience and move forward? 5. Is this project the best use of your resources right now? Now that you've considered the project and its potential outcomes from several angles, ask yourself whether this project is the best use of your resources right now. 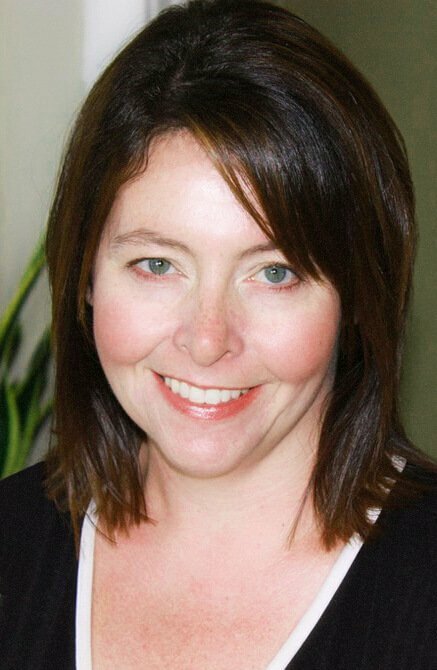 Do you have the time and financial resources needed to make it a success? Does the chance for success seem reasonable, and if you are successful, will it bring about changes in your life and business that will make you happy and be a good fit for your big-picture goals? Avoid: This project has some fatal flaw that makes it completely wrong for your business now, or in the foreseeable future. You're going to let this idea go, confident in the knowledge that you've made a smart decision. Wait: This project looks promising, but you don't have the resources to make it happen now. You're going to put it aside for now and come back to it when you have more time or money resources to commit. Wait: This project looks great, and you could commit to it now, but you have a different project in mind that has better prospects. You're going to put this project aside until you get the first project established. Go For It: This project looks like a great fit and is the best use of your resources right now. You're going to take the next steps to make it happen.